Cryogenics | Energy teams confirm breakthrough in Korea's petrochemical market. The delivery of a cold box for KPIC in December was closely followed by the shipment, via the Antwerp sea port, of another cold box to S-OIL, KPIC's neighbor on the Ulsan site, in January. 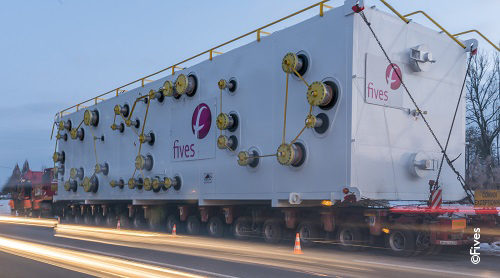 Containing an intricate assembly of brazed aluminium heat exchangers for an ethylene recovery unit, the cold box, weighing 122 tons, was first shipped by road from Fives workshops of Golbey, towards the river port of Strasbourg, on a 16-axle trailer. No less than two tractors were needed to handle the 245-ton convoy. Despite difficult weather conditions, the cold box arrived in Strasbourg on January 19 after a ten-day road journey, and was loaded onto a barge to Antwerp for final shipment towards Korea.